Want to be notified of new releases in SequencingDOTcom/RTP-API-OAuth2? This repo contains code for implementing OAuth2 authentication for your app so that your app can securely access Sequencing.com's API and app chains. The code in this repo can be used to quickly implement oAuth2 authentication for Sequencing.com's API. 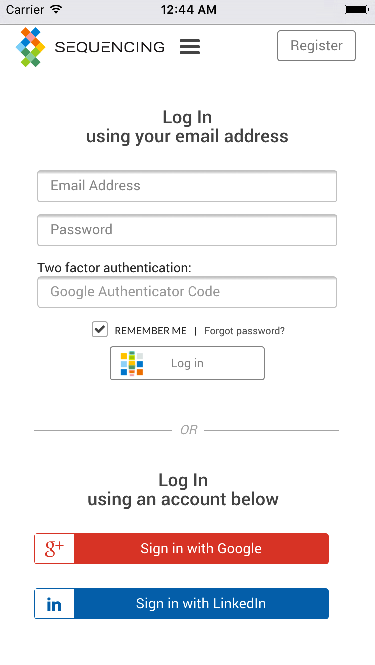 By adding oAuth2 authentication to your app, you'll then be able to use Sequencing.com's API to ehance your app with Real-Time Personalization. The code has also been deployed and can be accessed online as an OAuth2 demo. A end-user validates using thier Sequencing.com login and, if successfull, the demo will provide a list of genetic data files from the user's account at Sequencing.com. The demo will display a list of sample files if a user doesn't yet have access to his or her genetic data. These sample files are real genetic data files and are available for free for apps that use Sequencing.com's API. To code Real-Time Personalization technology into apps, developers may register for a free account at Sequencing.com. App development with RTP is always free. Once OAuth2 authentication is implemented, select one or more app chains that will provide information you can use to personalize your app. the information provided by the response allows your app to tailor itself to the app user based on the user's genes. the documentation for each app chain provides a list of all possible API responses. The response for most app chains are simply 'Yes' or 'No'. App Chain: It is very important for this person's health to apply sunscreen with SPF +30 whenever it is sunny or even partly sunny. While there are already app chains to personalize most apps, if you need something but don't see an app chain for it, tell us! (ie email us: gittaca@sequencing.com). 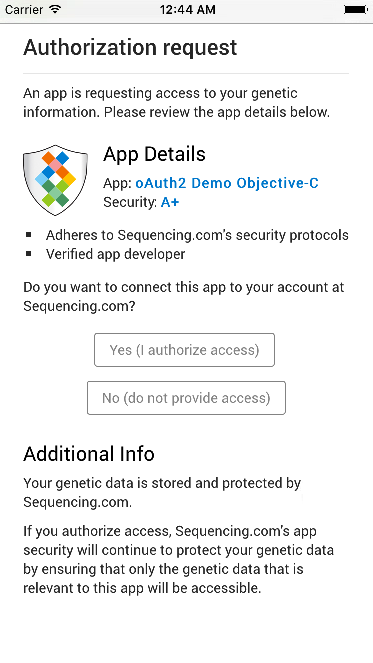 Sequencing.com uses standard OAuth approach which enables applications to obtain limited access to user accounts on an HTTP service from 3rd party applications without exposing the user's password. OAuth acts as an intermediary on behalf of the end user, providing the service with an access token that authorizes specific account information to be shared. If the authorization is valid, the API will send a JSON response containing the access token to the application. This repo is actively maintained by Sequencing.com. Email the Sequencing.com bioinformatics team at gittaca@sequencing.com if you require any more information or just to say hola. We encourage you to passionately fork us. If interested in updating the master branch, please send us a pull request. If the changes contribute positively, we'll let it ride.